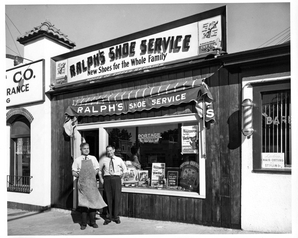 Ralph Roase opened his first shoe service shop in 1947 at 50th and Xerxes Ave. So. Minneapolis. In 1956 he had the opportunity to open a shop in the new Southdale Mall. The first enclosed shopping center in the United States and remained there until December 31 2011. 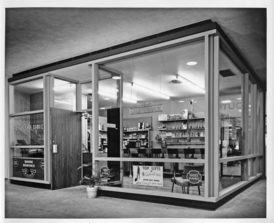 The 50th and Xerxes location remained open and was operated by his son Ron Roase until 1958. The Xerxes location was then closed and Ron joined his father at the Southdale location. Ron was the owner-operator of Ralph’s service from 1972 to 2001. His son Bill became the owner-operator following Ron’s retirement. 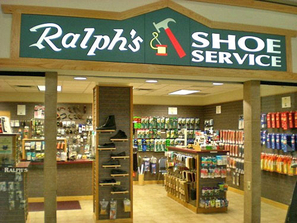 As of February 2012 Ralph's Shoe Service will be located at 6623 Penn Ave So. Richfield MN. 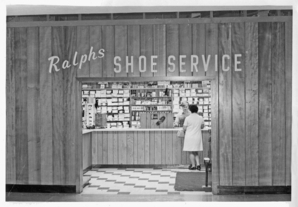 The original location of Ralph's Shoe Service at 50th and Xerxes Ave So. Minneapolis MN. Ralph Roase is shown on the right and Ed Kasperick is on the left.